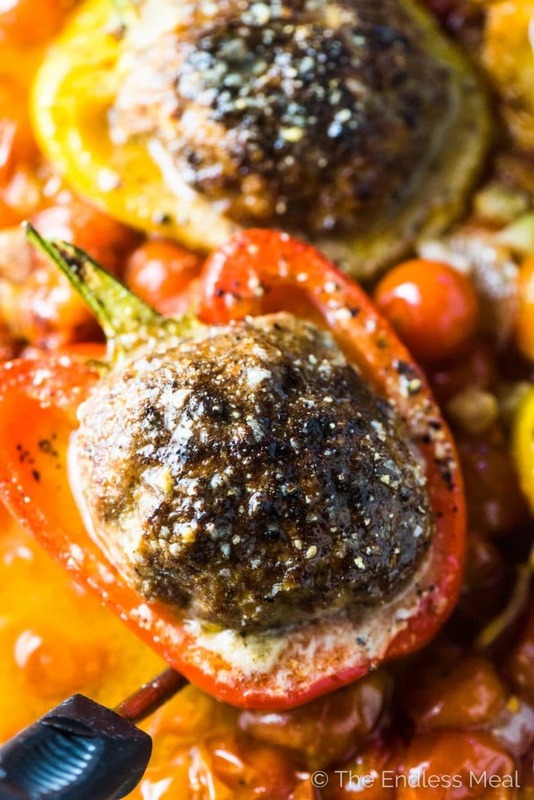 Meatball Stuffed Peppers are an easy to make one-pan dinner recipe. 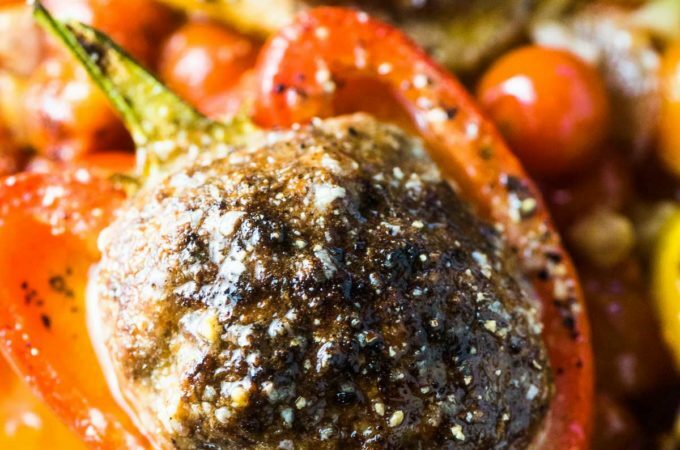 Bell peppers are stuffed with (grain-free!) 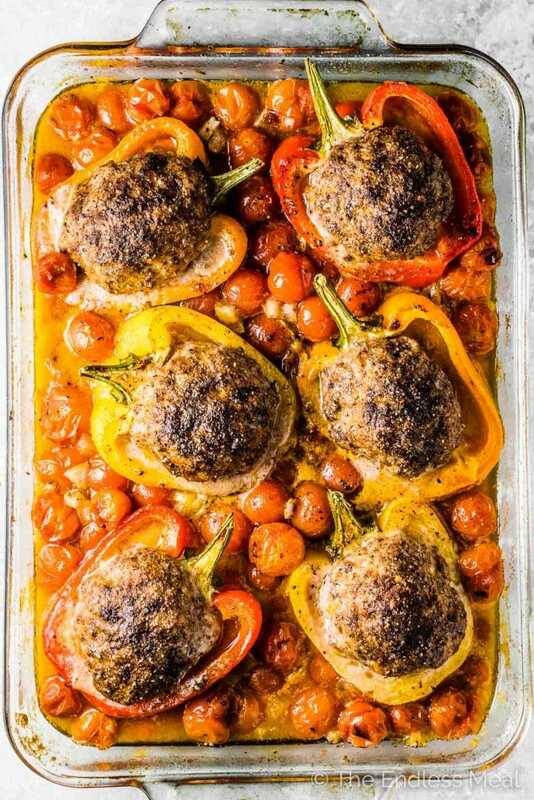 giant meatballs and roasted in the oven with cherry tomatoes. They're delicious! Can we have a minute to give some praise to quick and easy dinner recipes? 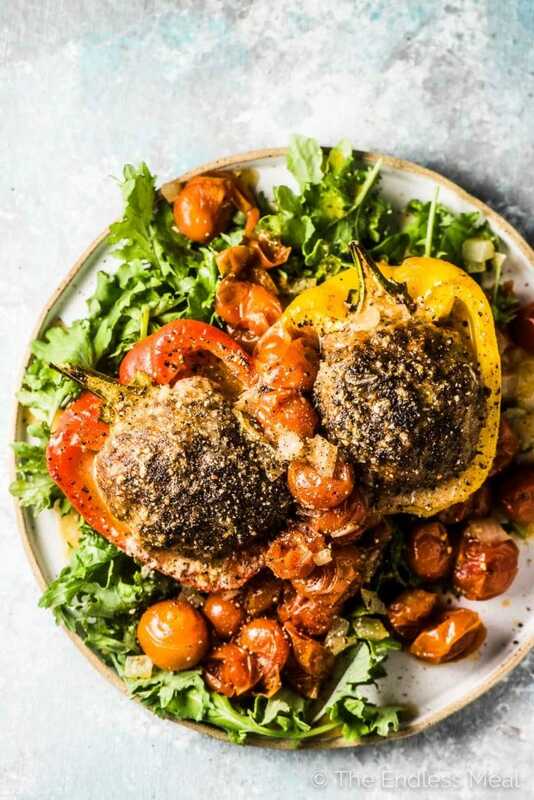 And by quick I mean 15 minutes of simple prep before you slide these stuffed peppers into your oven, tidy your kitchen, then pour yourself a glass of wine and relax. This recipe is so simple because the sauce pretty much makes itself and giant meatballs mean that you're not fussing over rolling tons of tiny ones. It's really easy. I like to fill a big plate bowl with spinach or baby kale and put the meatball stuffed peppers on top. When I pour the cherry tomato sauce over the top it wilts the greens and they become one with dinner. 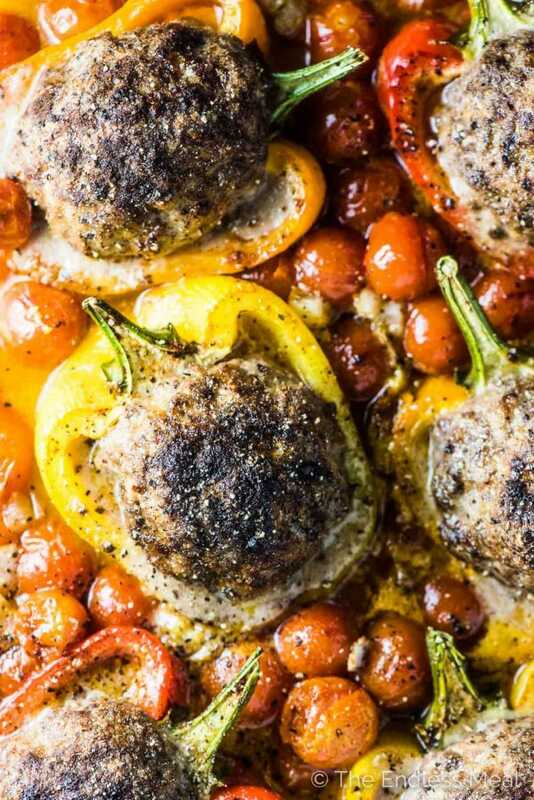 Tender meatballs + cherry tomatoes + peppers are reminiscent of spaghetti and meatballs but with way less work. It's a super healthy dinner recipe that feels like comfort food. Leftovers are AMAZING. Give it up for meal prep! Juicy cherry tomatoes make the most flavorful sauce with zero work. Put lots of cherry tomatoes and some onion, garlic, olive oil, salt, and pepper in a casserole dish. Cut 3 bell peppers in half, remove the seeds, and put them on top of the tomatoes. Mix the giant meatball ingredients then roll six meatballs and pop them into the peppers. Sprinkle a little paprika on top (to make them look extra pretty!) and pop them into the oven. That's it! After only 3 super easy steps you'll have dinner prepped. While I'm not one to turn down a butter-slathered slice of warm bread, I do try to avoid eating grains as much as possible. I feel much better when I eat grain-free. So when I cook for my family, I always opt for paleo alternatives in recipes. To make tender, Swedish-style meatballs, I use almond flour instead of the traditional breadcrumbs. It's a healthy alternative and I promise you that you won't be able to tell the difference. But if you stock breadcrumbs in your pantry, you can always use those instead. I've made this stuffed peppers recipe a few times since the idea was delivered to my mailbox. In the last issue (and very sadly the last English version they will publish) Ricardo Magazine had a recipe for veal stuffed peppers with a cherry tomato sauce. This version is so simple to prep since the cherry tomatoes create their own sauce as they cook and their liquid is released. Let's give it up for easy to make stuffed peppers! Turn your oven to 425 degrees. Add the cherry tomatoes, onion, garlic, olive oil, salt, and pepper to an 11×13″ casserole dish and mix well. Nestle the 6 bell pepper halves on top of the tomatoes. In a large bowl, mix together the meatball ingredients using your hands. Form into 6 large meatballs, place one in each bell pepper half, and gently press it down. Sprinkle the paprika over the top of the meatballs. Bake in the preheated oven for 40 minutes then remove from the oven and let it stand for 5 minutes before serving. I like to serve these peppers in a big bowl with lots of baby kale or spinach and pour the juice from the tomatoes over top to wilt the greens. The sauce is also delicious over pasta, rice, cauliflower rice, potatoes, or used to as a dip for some crusty bread. This recipe will serve four if you're not serving it with a starchy side like potatoes or pasta.